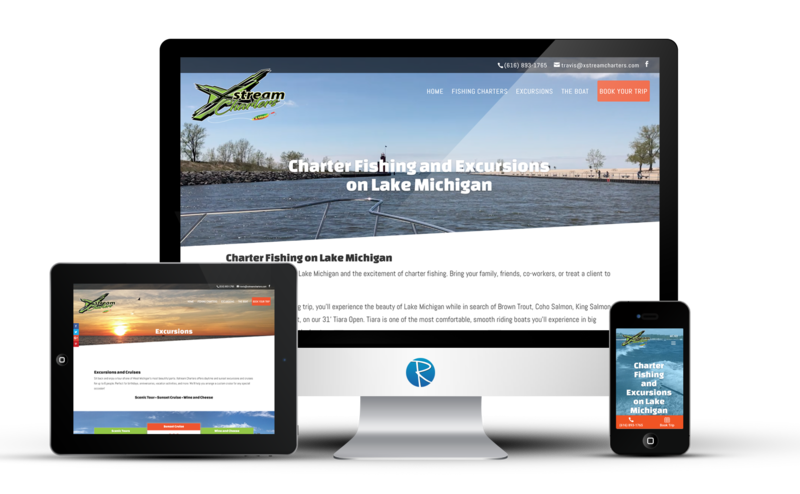 Xstream Charters offers fishing charters on Lake Michigan and came to us with the need to establish a website for this new business. We built a fully mobile optimized, WordPress site with an integrated booking system from Checkfront. It’s fully integrated into the site so users never have to leave the website to book and pay for a trip. A ready made system like this is a cost effective solution over a custom coded booking system built from scratch. In addition, Captain Travis can take bookings over the phone and enter them in using the Checkfront App and always see his charter calendar. We incorporated video of the client shot from their iPhone out on the boat to create visual impact. The experience of being out on Lake Michigan is an adventure, and displaying plenty of photos of a good day’s catch was vital to the communication strategy of Xstream Charters. The mobile version features large buttons to call or book a trip, making it a quick tap to get the customer booked!